I took an interest in the Democratic Republic of Congo (DRC) during my second year at university. I was required to create an interactive artefact and decided to try and find an under-reported global issue to tackle. 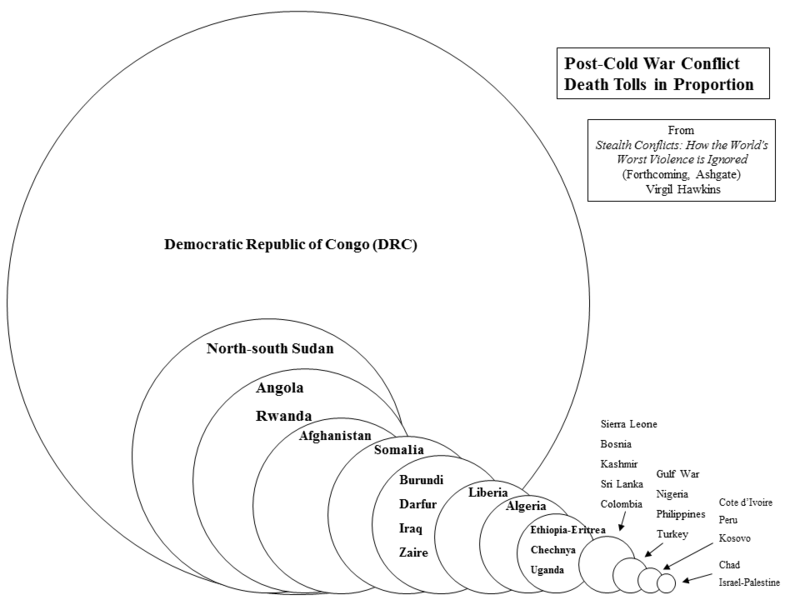 I came across this graph, from the book ‘Stealth Conflicts: How the World’s Worst Violence is Ignored‘, which gives a stark visual representation of the proportion of deaths in the DRC in comparison to other post-Cold War conflicts – a civil war which has killed more than 5 million people. 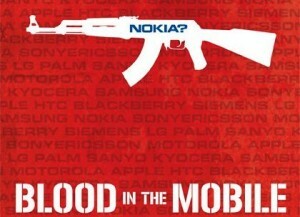 Three years later and Blood in the Mobile is complete. The final 82-minute product is powerful, sharp and impacting. Immediately the film has an edge, setting it apart from usual documentaries and planting it firmly on the big screen. While he also uses common investigative techniques such as talking to NGOs and researchers, Poulsen’s intrepid attitude and determination to depict the realities in the Congo is what makes this film so moving. The film journeys from challenging Nokia executives in shiny glass buildings in Finland to harrowing footage of confrontations in the claustrophobic mine of Bisie, Eastern Congo. Poulsen admits: “I didn’t make this a normal journalistic piece where you backtrack the minerals, how they are smuggled out Africa to Malaysia where they are smelted…” Instead, he takes the approach of a guerrilla film-maker with a mission. He wants to create a moving picture that inspires the viewer to act. By keeping the film focused on the target, talking to individuals in the Congo, NGOs and, ultimately, the ivory towers of Congress, he makes the path to change both visible and encouraging. Reception of the documentary, which is officially released in the UK on the 21st October, has been overwhelmingly positive. Already The Guardian has published a review, Press TV (above) hosted a discussion around it and even CNN broadcast an interview with Poulsen. Awareness alone of the bloodiest conflict since World War II isn’t going to bring it to an end. By linking conflicts to the mouths they feed, we are forced to start realising our share of the responsibility. Poulsen’s comparison of the colonial ‘Nokia’ rubber company profiting from slave-labour to the present-day Nokia profiting from another form of slave-labour exemplifies systemic problems with corporations that largely go unchallenged – a problem which must be brought to an end. Also check out “Phone Story“, a mobile game for iPhone and Android which depicts the story and was subsequently banned from the iPhone market. its a real shock to me as i was never aware of congos misfortune. the local media just would never mention these stuff – presumably for their own nations economy.